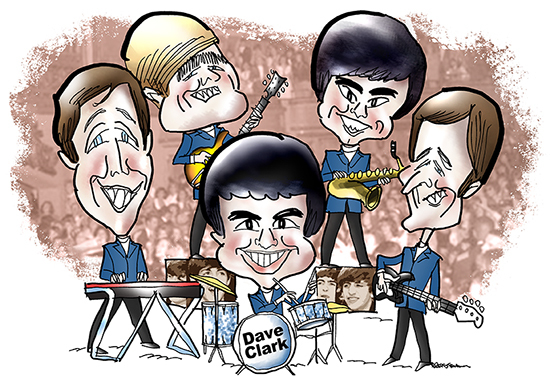 A tribute to British Invasion band The Dave Clark 5, who were inducted into The Rock And Roll Hall Of Fame in 2008. 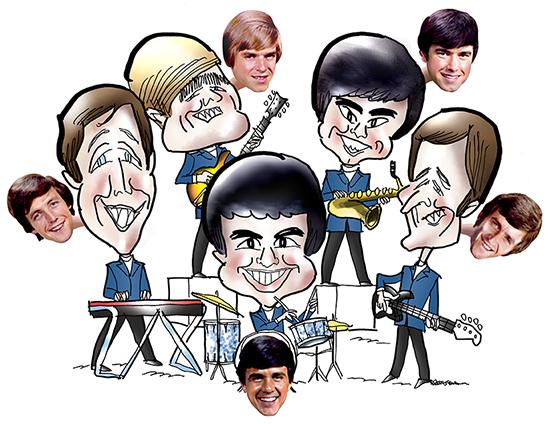 Scroll down to see the band members behind the caricatures. Scroll down further to hear the caricatures sing their way from line drawing to finished illustration. Front, L-R: Mike Smith, keyboards and lead singer on most of the songs; founder Dave Clark, drums; Rick Huxley, bass. Back, L-R: Lenny Davidson, guitar; Denis Payton, sax. One of my favorite Dave Clark 5 songs is Everybody Knows (I Still Love You), which was released in 1964. You can find the chords at Betty Lou’s Site for Guitar Underdogs, the best collection of guitar chords on the Web. ← Merry Christmas From Spokane!